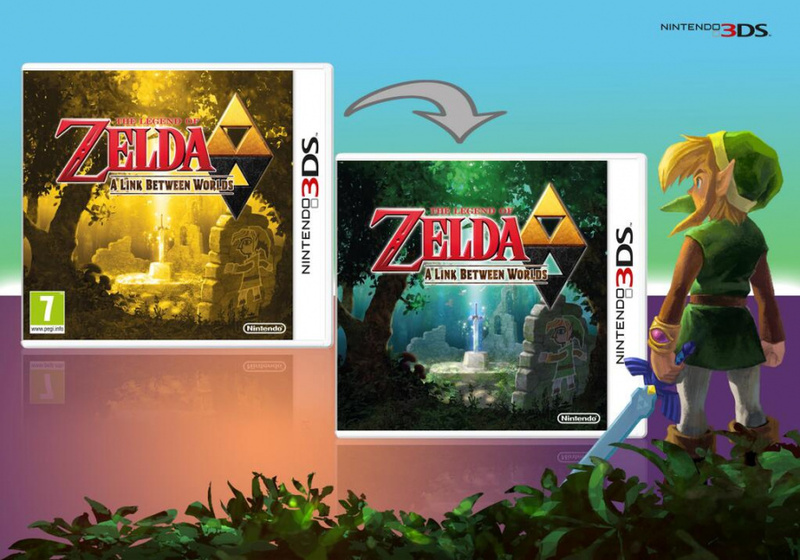 Nintendo of Europe and Nintendo UK previously revealed that The Legend of Zelda: A Link Between Worlds for the 3DS will feature a reversible cover sleeve for those purchasing the game in Europe. One side of the sleeve will feature the regular multicoloured artwork, with the other being basked in a lovely golden hue. The image above has now been shown off to tempt potential owners via Twitter. Which cover will you be proudly displaying on your shelf? Will you be buying the physical copy at all, or is the 3DS XL bundle just too good to resist? Classic traditional Zelda golden cover, but just in case you prefer the orginal artwork... Tad-dah! Awesome! Though I'll decide when I have it in my hands which side I'll use. Green one for me. The only golden one I like is that of Ocarina of Time. Pretty cool but I'll be getting the digital version with my pre-ordered Limited edition 3DS XL. Is it just me, or has every U.S. cover of zelda games released after Twilight Princess been gold? i'm liking the green cover better. more colors. Nice, but I never keep my game boxes. @MrMario02 Nope, they're not all gold. The bundle tempts me much even as a blue 3Ds owner. I prefer the non-golden one. If something this simple does not make it to NA, it will be too much. Yes it's just sheet of paper that slips under the 3DS game box cover so that shouldn't be to hard for NA to get... I hope. Ahhhhhhhhh so lovely..... How will I decide? @uel You don't keep your game boxes!!!? What do you do with them then? The Golden one looks gorgeous.. hope it comes to NA! I guess I'll be using the colour one. Gold just looks plain. Nice. I love it when companies do the double sided artwork for the game case sleeve. Nice boxart, hopefully we get the golden one too. The only thing that I can think of which would make this game more awesome is if it had a new four swords game included. The golden one looks nice but the colored one seems to come without a PEGI sticker. That would be nice. I don't like these stickers ruin a cover be it a game or DVD/BluRay cover. I like the multi-colour... but t has to come to north america first. Multi-color IF I get it. Dont see a reason why this would not come to America. Seems like a nice touch. I was planning on getting the Special Edition 3DS with this game bundled digitally. Now they put out awesome cover art. Both covers are very nice! @skywake I'll get both. They got me. They got me good. I'll sell my download code though.